Looking for a unique gift to give a recent college graduate? 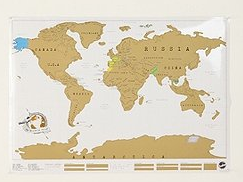 How about one of these world scratch off maps from Urban Outfitters? Perfect for the grad who is spending the summer traveling the world jumping from hostel to hostel and only $34. Remember those glory years without real responsibility before you started your first big job out of college? Take me back 15 years please! I'm lucky if I make it out of the country more than once a year now! WOW love the map. I'd like one for myself!